Local medical transport isn't always an option. Local medical transport isn't always an option. When a loved one requires emergency medical transport that can't be provided by local medical transport services, a medical transport charter provides another option. Chartered private medical transport can get you there safely and quickly in the case of an emergency situation the local hospital isn't equipped to handle, when you or a loved one is in need of a second opinion, or treatment is being sought at a distant medical facility that specializes in your condition. Our staff members, from the people who take your phone call to the medical staff present on the flight, understand how overwhelming it can be to think about safely transporting a loved one to a distant facility for extended care or lifesaving treatment. That's why we work closely with you, from the beginning, to obtain important information needed to care for your loved one. You can also expect to be informed of the process every step of the way so there are no questions regarding the care you or your loved one receives. When important paperwork needs to be filled out, we assist you to ensure essential information is submitted. In addition to handling last- minute emergency situations where the patient needs medical transport to a faraway facility, medical transport charters can also be scheduled in advance. Patients that require occasional treatment out of state often are unable to travel far without medical care and support. 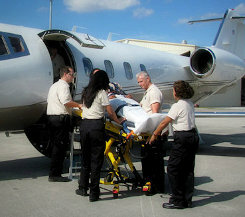 But when a reservation is made at least 24 hours in advance, the medical team that will care for you or your loved one on the charter has time to prepare the medical transport with everything needed to provide excellent medical care while keeping the patient comfortable throughout the flight. Once your loved one is on the air ambulance, a staff of trained and licensed medical personnel will be there to provide care the entire way. The size of the medical team present is dependent upon their patient's needs and the length of the transport, and they are trained and equipped to handle any medical situations that should arise during the flight. Securing the services of an air ambulance means more than receiving medical care while in-flight. The medical care provided by the medical transport team begins when the patient is picked up from the medical facility or residence and doesn't end until they safely reach their destination. This continuance of care ensures that the patient is safe and receiving the attention needed throughout the chartered transport. Being transported to a distant medical facility can be unsettling for the patient, whether an adult or child. Because of this, most medical transport charters can accommodate up to three family members who can remain with the patient, providing the patient with the peace of mind that comes in knowing they're not alone or without family. From the beginning to end of the process, we will work with you to ensure a safe, comfortable medical transport is provided.